Need an easy crowd-pleasing vegetarian dish to throw on the grill? Everyone loves sweet potatoes, especially kids, so try these simple grilled sweet potato skewers with savory-sweet honey mustard. The recipe calls for sweet potatoes, green and red bell peppers, red onions, a little bit of salt and pepper, and of course, some honey mustard. This grilled sweet potato skewers with honey mustard recipe is the perfect vegetarian barbecue recipe for sweet potato lovers. Be careful if you're planning on serving this dish to vegans, however, as many vegans avoid eating honey. This recipe is gluten-free. First, prepare your sweet potatoes by giving them head a head start in the microwave. Prick them a bit with a fork, then place them in the microwave on high for three minutes. Turn them over (carefully! ), then microwave for another 1-2 minutes, until almost tender and soft, but not quite. Allow your sweet potatoes to cool, then peel them if you'd like, and chop coarsely into about 1-inch chunks. Next, combine the sweet potatoes, chopped red and green bell peppers and red onion in a large bowl. In a separate small bowl, whisk together the honey mustard and the two tablespoons of water, then add to the sweet potatoes, peppers and onions in the bowl, tossing very gently to lightly coat. Next, prepare your skewers, by threading a mixture of sweet potatoes, onions and peppers. Make sure your pre-heated grill (or indoor grill pan) is lightly greased. 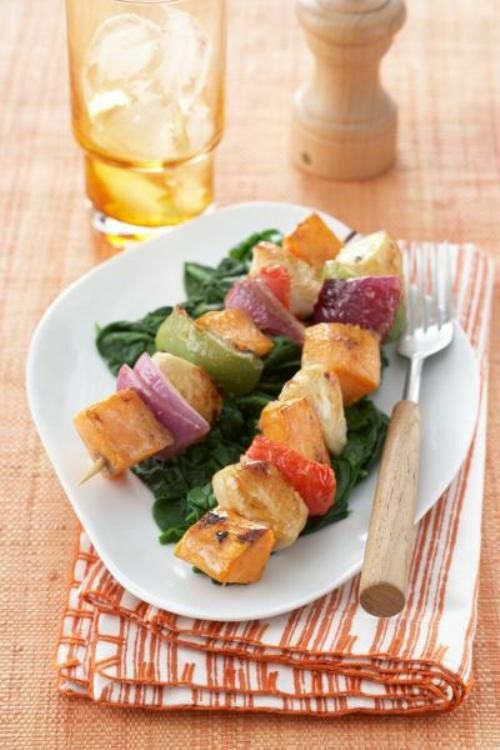 Grill your sweet potato skewers for about 4 minutes on each side, brushing with any remaining honey mustard. Note: If you don't have an outdoor grill or an indoor grill pan, you can still make this recipe using your oven's broiler.